What a nice guy! Thanks Anabela! Sounds like you had a great weekend. I cannot wait to hear about quilt night! I sent you the one with the dark-haired model on the cover! I thought I'd keep the more terrifying cover for myself. Hope you like it! Ooo snap! 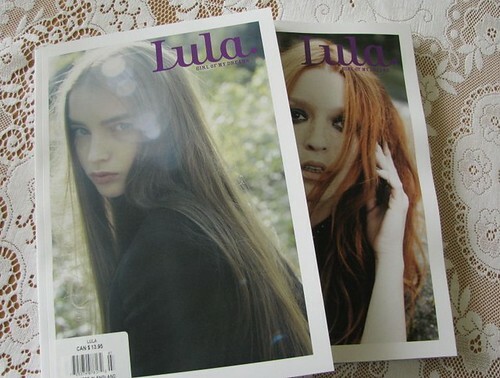 After reading your post gushing about Lula magazine I bought one myself today to celebrate my end of exams! yeye! I hope you like it! There's a lot to look at in it, so many beautiful photos! That's so nice of you! haha that cover is creepy, but I'd be happy with it as well. Would you just send me an email about what colors, and size you would like for mittens? Oh, and which pattern you would like, the normal star/flower one, or the love mitten. Then I will start on them right away!